This morning frequently wrong rumor site ran a story claiming that George Takei would show up in JJ Abrams’ Star Trek prequel. Of course this flies in the face of everything anyone associated with the production has had to say on the matter. The people actually making Star Trek have been pretty clear on this: None of the original cast will be in the film except Leonard Nimoy. Still, AICN insists it’s true. Except of course their story is based on nothing but vapor. All they have is an interview with George Takei where he basically says “no comment”. That’s hardly a confirmation that he’s in it. AICN has invented a story out of nothing. Comedy Central’s golden boy Stephen Colbert took a minute out this week to honor people who are not white. Since he only had a minute to do it, he combined two cultures together and honored them all at once in his annual Ethnic Minute. And since he had to combine two cultures he needed to find someone who was both Black and Chinese to honor. He picked Commander Worf. I’d like to talk to you for a moment as a Star Trek fan. It stopped being fun to be a Star Trek fan some time in the 90s (probably when Voyager got lost on television), but hey we’re still around. We do other things these days, we watch romantic comedies with our wife, and when she’s not looking we get excited about Battlestar Galactica; but for a lot of the people who have recently been waiting in line for movies like Star Wars and The Matrix, it’s Star Trek that’s their first love. The old girl just hasn’t been treated properly in awhile. We have high hopes that you’ll be treating her better. Except some of us were wondering, do you know what you have your hands on here? I ask, because so far your efforts to bring a new Star Trek movie to the screen have been shrouded in absolute secrecy. I understand that you might not want to spoil the entire plot and that you can’t exactly announce cast members until they’ve been hired (I’m warming up to John Cho as Sulu by the way), but that’s not what I’m talking about here. The problem you see, is that this is not Cloverfield or Mission Impossible. Those properties don’t have decades worth of dedicated fans and history behind them. This is Star Trek. It’s been around since the 60s, and the eyes of millions upon millions of devoted followers are upon you around the world. I question whether or not you’re aware of Star Trek’s fan base, because so far you’ve been treating your project as if it’s Cloverfield, when in fact it is not. I’ve heard you mention us, your film’s fan base, in several of your interviews; but simply mentioning us doesn’t necessarily accomplish anything. You’re playing your cards awfully close to your vest. As with Cloverfield, we’re not even entirely sure what you’re calling this new Trek adventure, let alone what this movie is about. With Cloverfield it’s exciting, because you’re producing something brand new and unknown. 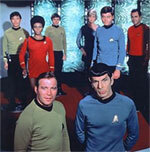 With Star Trek, well I have to be honest, it’s making us Star Trek fans pretty uneasy.